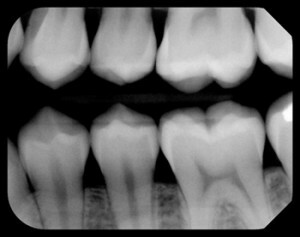 Digital X-Rays are an important part of a dental exam and are required for all new patients. X-rays can expose a variety of dental issues including tooth decay and tartar buildup, impacted teeth, and bone loss related to periodontal gum disease. Circle C Dental uses digital X-Rays — we feature both digital intra-oral sensors and digital panoramic sensors to view your entire jaw — to help us diagnose and determine the best dental treatment for you. Digital X-Rays (and we use top of the line Gendex GXS-700 sensors) offer benefits for both the patient and the practitioner. Digital X-rays are faster and more comfortable than traditional film X-Rays. 90 percent less radiation means that digital X-rays are safer for patients. And, because there is no need for film or processing, digital X-rays provide a clear image almost instantly. At Circle C Dental you can expect convenient, professional dental care from start to finish. In addition, if you are ever curious what your teeth look like, we have cameras that can show you what your teeth look like in your mouth. It can be quite eye opening! Contact us today or call us at 512-301-2483 to schedule your appointment!